COLORADO RIVER — The Discovery Channel will air the “Rival Survivor” episode on Wednesday, starring two opposing U.S. 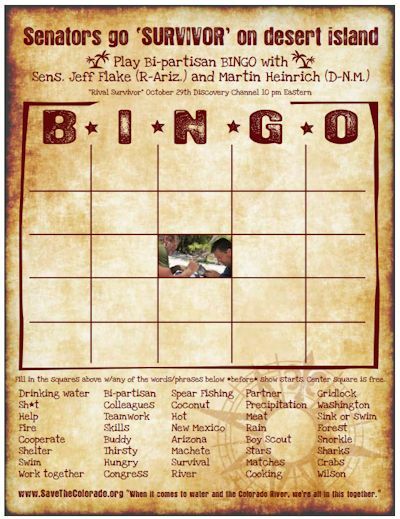 Senators, Jeff Flake, a Republican from Arizona, and Martin Heinrich, a Democrat from New Mexico. The show highlights how the Senators worked together to meet their basic needs on a deserted island and is providing a bit of a guidepost for how the gridlocked U.S. Senate needs to work together too. In that vein, the Save The Colorado River Campaign sees the potential for a great example of how the Southwest U.S. must approach its management of water and the Colorado River, which both New Mexico and Arizona rely on for their water supplies. 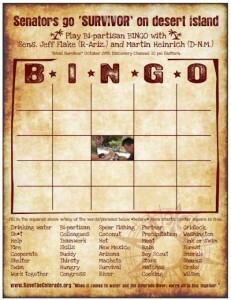 With the theme “When it comes to water and the Colorado River, we’re all in this together” the bingo game (download and print here, image left) gives Rival Survivor viewers a way to create their own unique bingo card and play along at home or together. The ecological health of the Colorado River and the quantity of its water supplies are in decline throughout the seven southwest states in the river basin, including New Mexico and Arizona, according to the Save the Colorado River Campaign. Most recently the U.S. Bureau of Reclamation and four large municipal water districts announced the creation of a pilot program to work together to increase water conservation in four states. Much more cooperation will be needed to address the threat of climate change, river health, and population growth throughout the region which runs from Denver to Los Angeles and beyond. Viewers are encouraged to use the #RivalSurvivor and #CORiver hashtags on twitter.